Over the years, increase in demand and popularity have led the stamped concrete industry to become a very competitive market. In order to keep up with the competition some contractors have adopted unconventional tactics to lure customers in. It is one of our goals, here at Dan-Tam, to provide our customers with the knowledge necessary to avoid such scams, crooks, and contractors practicing substandard work ethic. Always ask for references!!! If a contractor is not able to provide a sufficient list of completed jobs or references, it is doubtful they have the experience you as a customer are looking for. Avoid baiting! Any contractor offering extreme discounts or coupons has to make up their overhead costs elsewhere. It is likely that they do this by raising the base price of the product. Therefore, not saving the customer any money in the end. (Example: Customer has coupon for $300.00 off any project over 300 sq. ft. The quote comes in at 330 sq ft of work. Instead of charging the customer the usual $12/sq ft the contractor ups the base price to $13-$14/sq ft. In the end, the contractor actually makes money off of the coupon.) Contractors might also make up for this overhead via substandard labor and material, which effects quality of work. *Note all prices used above are for example use only, and not necessarily a reflection on Dan-Tam. Be cautious of contractors making “100% guarantees” against cracking or color fading. As concrete ages, the earth shifts, and weather changes (freezing and thawing), there is always the possibility for a crack to form and colors to fade. Any concrete contractor with experience will agree with this. The only guarantee that can be made is that the contractor will take every possible measure to prevent, give quality workmanship, and assist you in maintaining the original beauty. Be mindful of showrooms. 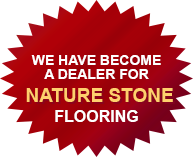 As a stamped concrete business owner of over 20 years, I have never felt it necessary or found time during the limited stamping season to create a showroom. 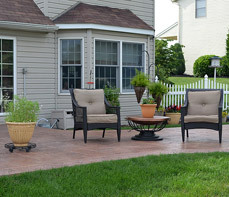 Anyone can create the perfect stamped concrete in a controlled environment. It’s the actual jobs completed and customer satisfaction that matter. Again, this is where references come into play. Be advised of PA state laws regarding deposits. It is law that no one contractor can charge more than 1/3 of the total job cost as their deposit. Under no circumstance should you give more than 1/3 of your total job cost as a deposit, or give money without a contract signed by both parties involved. In providing this knowledge to past, present, and future customers, we at Dan-Tam hope this assists you in making an informed decision when it comes to selecting a stamped concrete contractor. We wish everyone the best of luck on their project, and thank you for considering Dan-Tam for your stamped concrete needs.